Even with Saturday’s blowout loss, that was a very satisfying weekend series against the Red Sox. The Yankees won two of three and both wins were convincing (so was the loss, sadly). They’ve played 81 games now, exactly half the season, and the Yankees have baseball’s highest winning percentage at 54-27. Pretty awesome. 6. LF Ronald Acuna Jr.
Another crazy hot day in New York today. The internet tells me we’re going to get back down into the low-80s by the end of the week, so hug your air conditioner tight. This’ll all be over soon. Anyway, tonight’s series opener will begin at 7:05pm ET and YES will have the broadcast. Enjoy the ballgame. Injury Update: Masahiro Tanaka (hamstrings) will make a rehab start with Triple-A Scranton on Wednesday. He’s scheduled to throw 70 pitches. If that goes well, Tanaka could rejoin the Yankees for Monday’s doubleheader in Baltimore … Austin Romine (hamstring) is doing better and is available to play. Aaron Boone said he’s giving him the extra day just to be safe. Wouldn’t surprise me if Romine sits tomorrow too, then catches Wednesday afternoon before the Thursday off-day. We’ll see. 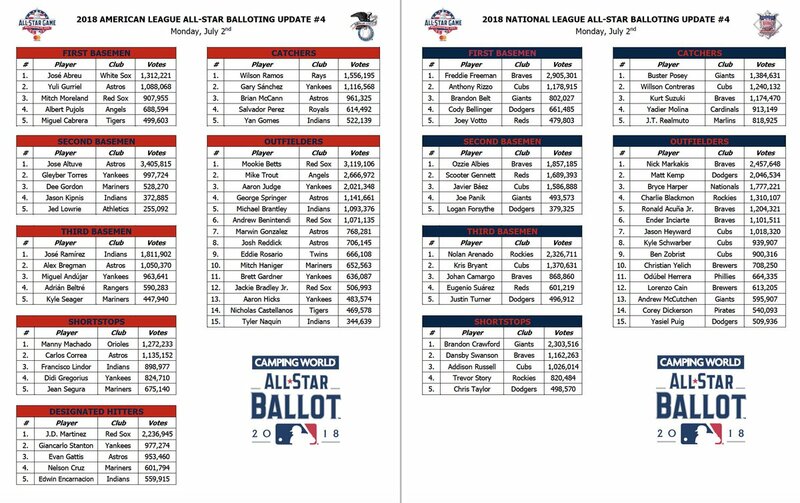 All-Star Game voting update: MLB released the latest fan voting update for the All-Star Game and Judge remains the only Yankee in line to start the game. Here’s the voting update. Torres, Stanton, and Gary Sanchez are second at their positions, Andujar is third at third base, and Gregorius is fourth at shortstop. Fan voting ends at 11:59pm ET this Thursday. Here’s the ballot. Go vote a few dozen times. Awards! 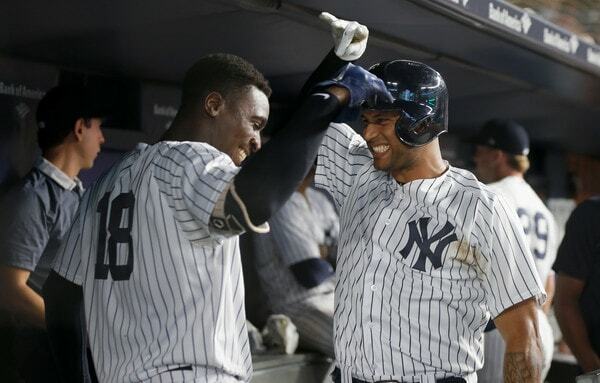 : Congrats to Andujar, who was named the AL Rookie of the Month for June. He is the first Yankee to be named AL Rookie of the Month since … Torres in May. Yankees have won six of the last nine AL Player of the Month awards (Judge won it four times last year). As best I can tell, Andujar and Torres are the first set of teammates to win back-to-back Rookie of the Month awards since Craig Kimbrel and Freddie Freeman in 2012. Pretty cool.